Apart from being all female and playing on Sunday the information below is also correct for women’s and girls teams. The age group also requires an age co-ordinator. Contact admin@leichhardtsaints.com for information. Players can join Leichhardts Saints the year they turn 5. U6 Teams are made up of 10 – 12 players. Games kick off at 9am at King George Park Rozelle – arrive by 8:30am to set up fields. Team split in two for matches and play 4 on the field with reserves subbed on and off.. We have a strict equal time policy for all players with as much time spent on the field as possible. There are no goal keepers. There is no grading for U6s and is most fun if you can join with your friends. Coach/ Manager– make this the year you become more involved in your children’s sport. Register yourself as coach/ manager when registering your player. U8 move to a home and away format… home games are played at King George Park Rozelle. The furthest away may be Roselands. The mini field is slightly larger than U6 and U7 fields … you might remember the field at the far end of KGP with the fixed goal posts. The game is played with 7 players on the field including a goal keeper – 9 players per team is ideal. Coach/ Manager- make this the year you become more involved in your children’s sport. Register yourself as coach/ manager when registering your player. The game is a home and away format… home is at King George Park furthest away may be Roselands. Age Coordinator is ********** who will be in contact later when the teams are being formed. Under 10’s play on a larger field (half field), with 9 players on the field including goal keeper. The Age Coordinator is ********** who will be in contact later when the teams are being formed. Teams play with 11 players on the field including goalie – up to 16 can play in any game. Training day is Wednesdays 4:45 – 6pm at SSC Leichhardt Campus. Age Coordinator is ************ who will be in contact later when the teams are being formed. JR Coordinator who is responsible for coordinating the JR schedule/ coaching sessions /JR Game day mentor/ coordinator – this role can be shared as it requires being at KG when the games are on to ensure that the JR’s get to the correct field/ know what they are doing and provide advice on refereeing. 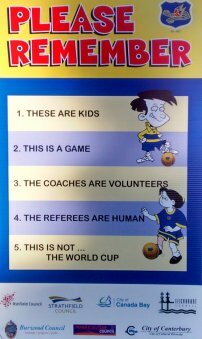 The mentor would ideally be a referee or player themselves. If you are interested in either of these roles please contact admin@leichhardtsaints.com .Please note that it is a requirement for each JR to have a parent / adult present when they are refereeing at King George on Saturday morning for support. Coach/ Manager – make 2017 the year you become more involved in your children’s sport. Register yourself as coach/ manager when registering your player. Grading sessions are not usually scheduled for U14s and older. Depending on registration numbers a grading may or may not be held, but you will be notified if grading is required. At this point we assume you will return to your previous season’s team.